Arrr - may not be what their chanting, but modern day pirates are for real. Their attire may not be sporting eye patches or white billowy sleeved shirts, but they are just as vicious as they have ever been. 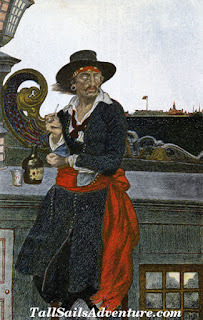 Pirates today are far more sophisticated with computer technology within their grasp as well as gaining insight from the media. It's much easier for them to identify who their next victims may be, and they don't have to travel needlessly throughout the waters or vacant islands to make their attack. Modern day pirates are really nothing more than terrorists at sea waiting to kill their victims so they can loot treasure, steal high dollar yachts, cruise ships, and even take over oil tankers. A force no one wants to reckon with, modern day pirates still lurk out at sea today. Arrr! Just when you thought you have seen them all, here's a cute one for your kids! A cute pirate that is, but it isn't what you may think! A blogging friend of mine has her kids hooked on sock monkeys! I couldn't resist sharing the one she has on her blog in that the sock monkey is dressed up like a pirate - arr! Normally pirates have parrots on their shoulders, but perhaps after seeing this photo your kids will want a pirate sock monkey! Be sure to check out the pirate sock monkey for a good laugh! Sailing upon the high seas is a dangerous but thrilling adventure for the sailor. The sea itself presents one and their vessel with enough potential threat, but there is another terror at sea everyone wishes to avoid - pirates. 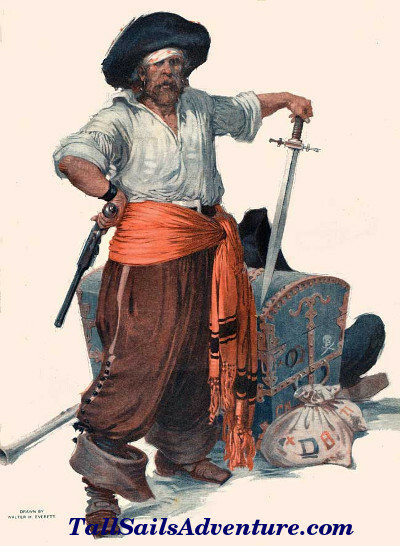 For centuries pirates have threatened many ships and captured and killed many crew members. The ancient threat of pirates terrorizing the men and woman who sailed the high seas still remains to be a modern-day fear. For some their means of travel in the high seas is by their own man-power rather than by sails gracing them with endless fuel. One such adventurer plans to hopefully avoid the pirates as he travels in a 26' man-powered pedal boat! The 38 year old Jason Lewis is confident that the pirates will leave his small craft alone as he peddles 1800 miles. For his sake I certainly hope he is right! It's time to plan those family vacations! Have you taken your family to Disney? Florida is a wonderful place to go sailing and you can have quite a bit of fun with Pirate Adventures there too! When planning your vacation to Orlando, a difficult decision in your planning process are the endless possibilities for admission tickets. One thing to consider is the fact that Disney tickets are now available for different days and options, from one to ten days for what is called, "Disney Magic Your Way". To get Disney Magic Your Way you can choose what would suit your family the best. You won't want to forget to get tickets for Sea World, downtown Disney Pleasure Island, Disney's Typhoon Lagoon, and Blizzard Beach Water Parks! For night-time fun, dinner shows in Orlando are very popular. The Pirates Dinner Adventure may suit your fancy as you are surrounded with the pirate decor, attire and pirate fantasy. I've always liked pirate attire, and who can resist an adventure of treasure? The Pirates Dinner Adventure is musical entertainment filled with stunts and tons of food for a pirates big appetite! So if you're ready for that pirate adventure or other things Disney, grab your Disney World tickets and get your trip planned. Arr! The time is moving onward closer to the dates for the Gasparilla Pirate Festival! In Tampa, Florida a pirate festival began in 1904 called the Gasparilla Pirate Festival, and the festival is celebrated each year. Since ancient times man has succumbed to the power of gold. From the time of ancient Egyptians, Greeks and Romans to more modern times, man has had an affinity for gold. 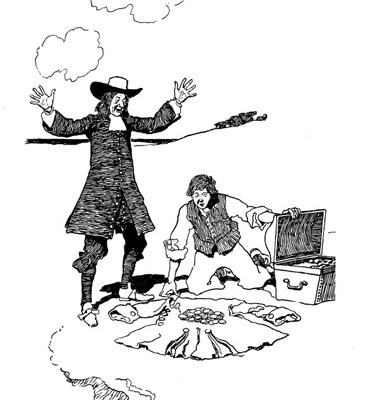 Pirates and plunderers went to lands far away to acquire a potential stock pile of treasure. One such story was the treasure of Captain Kidd found by several men. 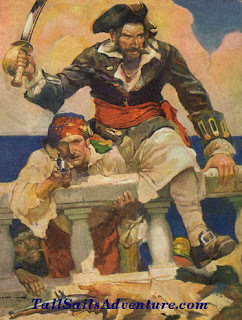 To bring back some of their story of old, here's an excerpt from when they found the treasure, which belonged to Captain Kidd; "There were two-and-twenty bags in all in the chest: ten of them full of silver money, eight of them full of gold money, three of them full of gold-dust, and one small bag with jewels wrapped up in wad cotton and paper. "'Tis enough," cried out Parson Jones, "to make us both rich men as long as we live." Rich men indeed were the ones who acquired gold coins, both then and now. In all ages, man has been fascinated with the beauty and magic of gold, and with its power to change lives. While you may not be able to locate a wrecked ship with sunken treasure, you would still be fascinated with collecting gold coins, but it's just not the same as sunken treasure. Arrr! Avast! 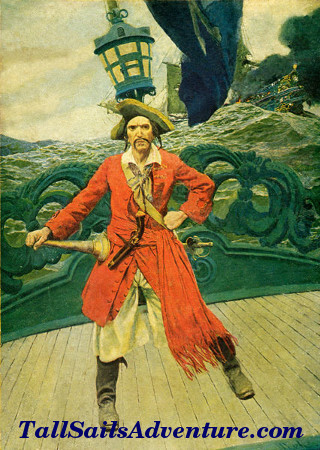 If one ever wanted a short story to summarize the characteristics of a pirate, and pirate treasure, this narrative from the 1800's succeeds at this task very well. In the mind of the mariner, there is a superstitious horror connected with the name of Pirate; and there are few subjects that interest and excite the curiosity of mankind generally, more than the desperate exploits, foul doings, and diabolical career of these monsters in human form. A piratical crew is generally formed of the desperadoes and runagates of every clime and nation. The pirate, from the perilous nature of his occupation, when not cruising on the ocean, the great highway of nations, selects the most lonely isles of the sea for his retreat, or secretes himself near the shores of rivers, bays and lagoons of thickly wooded and uninhabited countries, so that if pursued he can escape to the woods and mountain glens of the interior. The islands of the Indian Ocean, and the east and west coasts of Africa, as well as the West Indies, have been their haunts for centuries; and vessels navigating the Atlantic and Indian Oceans, are often captured by them, the passengers and crew murdered, the money and most valuable part of the cargo plundered, the vessel destroyed, thus obliterating all trace of their unhappy fate, and leaving friends and relatives to mourn their loss from the inclemencies of the elements, when they were butchered in cold blood by their fellow men, who by practically adopting the maxim that "dead men tell no tales," enable themselves to pursue their diabolical career with impunity. Drain, drain the deep bowl and fill." "Conscience, the torturer of the soul, unseen. But to our minds what edicts can give law? Your crimes, and your own conscience be your hell." With the name of pirate is also associated ideas of rich plunder, caskets of buried jewels, chests of gold ingots, bags of outlandish coins, secreted in lonely, out of the way places, or buried about the wild shores of rivers, and unexplored sea coasts, near rocks and trees bearing mysterious marks, indicating where the treasure was hid. And as it is his invariable practice to secrete and bury his booty, and from the perilous life he leads, being often killed or captured, he can never re-visit the spot again; immense sums remain buried in those places, and are irrecoverably lost. 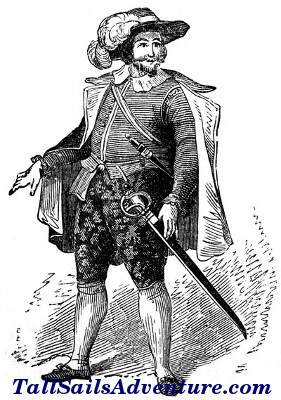 Search is often made by persons who labor in anticipation of throwing up with their spade and pickaxe, gold bars, diamond crosses sparkling amongst the dirt, bags of golden doubloons, and chests, wedged close with moidores, ducats and pearls; but although great treasures lie hid in this way, it seldom happens that any is so recovered. Felix the cat is back in this cartoon to rescue his golden goose from Captain Kidd. Captain Kidd stole the goose that laid the golden eggs, but couldn't get the goose to lay more golden eggs. It's no surprise that a pirate would want a goose that laid golden eggs! Now here's something you don't see every day! Wow, this is a very unusual antique treasure, which I saw up for auction on Ebay. I wasn't the winner of this cross bones padlock, in fact I didn't even bid on it, but I found it to be quite interesting. 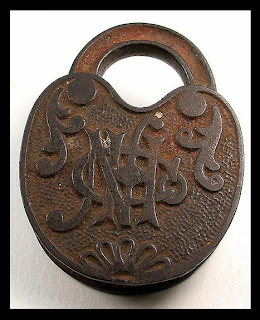 This is a padlock manufactured by the National Hardware Company, as indicated by the initials on the reverse, which dates it to circa 1890's. Truly a unique treasure, and one that you would have to assume was manufactured for pirates? Now matey, your imagination can run wild on this one! Imagine the treasure chest this large 2 1/2" X 3 1/4" padlock kept hidden away! Arr! Could it be that it is indeed a pirates cross bones padlock lost long ago? If so, who found the treasure chest it belonged to, and who ended up with the treasures within? Or, was there even a treasure chest? Well Bucko, you get to decide whichever story your imagination prefers, as the truth may never be known! I love a good mystery! The seller on Ebay purchased the pirate padlock from an estate sale in Waitsfield, Vermont. The Ebay auction for the antique pirate padlock was started at $9.99 and closed for $330.09 with 23 bids from 6 different bidders. The photos were taken by the Ebay seller, and used with his permission - Ebay Seller: Ski-vt. Thanks David! Like videos? As we add videos we will update the list below so you can choose a video to watch. Be sure to check back for new videos added. If you love a tall sails adventures, National Geographic's "Blackbeard Terror at Sea" is available on video for your home theater viewing! Have you ever wished you could have found an old treasure box filled with gems, silver, gold and old coins? From the time of ancient Egyptians, Greeks and Romans to more modern times, man has had an affinity for gold, and gold bullion. In all ages, man has been fascinated with the beauty and magic of gold, and with its power to change lives through it's inflation-fighting traits. You can create your own treasure load by investing in gold bullion! Ingots are generally gold ingots or silver ingots of pure bullion cast in a convenient size and shape. Coins have a currency value or they are actually defined as ingots. Buying gold has been recognized for centuries as one of the best ways to preserve one's wealth and purchasing power. Gold bullion is a unique investment, and certainly one that any pirate would aspire to behold. Time to fill your treasure chest so you can have golden opportunities to look forward to in the future. Arrr! Sailing on down the road in your vehicle you glance over to a passing car. There you see a character lightly bouncing in the passenger seat dressed up like a pirate. You may not realize the character is actually a dummy called, "Buddy on Demand" and that the dummy (less the pirate attire), was purchased for security reasons! Woman who fear driving alone may want a Buddy on Demand to keep the road pirates away. With an easy flick of a switch, she'll be joined by a blow-up male passenger, which inflates instantly beside her, and is preferably dressed as a pirate, of course! Buddy on Demand is the innovation from a women's Internet site called Sheilas' Wheels. What will they think of next? Although a woman might want to get a Buddy on Demand, she should be aware that the dummy's ego is extremely over-inflated. I wonder if she'll be waving a pirate flag from her antenna? Arrr! Have fun with this far fetched fun pirate story for all ages. Time Looters will loot 10 minutes of your time to locate the dirty tea towel pirate map and hidden treasure. So sit back and relax and have a good laugh as you travel back in time to visit Captain Big Beard. Watch both parts to the Pirate Captain Big Beard story. Well me friends, without proper pirate attire you may find yourself walkin' the plank! Arr! 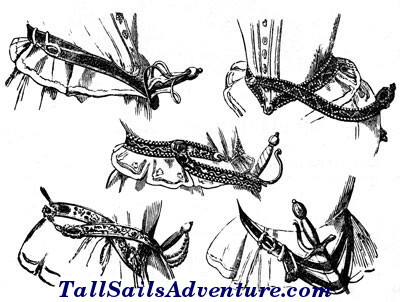 Here's some tips for pulling a pirate costume together, without having to rob too much from you're pocket book. Look carefully at the pirate attire images on this page for more ideas for your pirate costumes. Eyeliner thick and heavy around the eyes. Johnny Depp wore it well, didn't he? In Tampa, Florida a pirate festival began in 1904 called the Gasparilla Pirate Festival, and the festival is celebrated each year. During the festival a fictitious, “piratechnic” sea battle is created over Hillsborough Bay between the City of Tampa, and the Pirates of Ye Mystic Krewe of Gasparilla. While planning your Florida vacation you may also want to consider a stay in an Orlando Vacation Home, centered around fun theme parks, and sparkling white sandy beaches. Orlando is the number one tourist destination in the world, and boasts 7 major theme parks. There is close access to Lake Eola, and you can enjoy festivals, outdoor concerts, or even a gondola ride on the lake. The sports complex, theater, and opera are all located centrally to expand your imagination with many possible entertainment venues. Are you planning to attend the Gasparilla Pirate Festival or Children's Parade? Would you like to let our fans know how you enjoyed the festival? If so, please bookmark this page, and then come back and comment on this post to tell us how you liked the event. Or, if you attended the Gasparilla Pirate Festival or Children's Parade this year, we would like to hear about your experience as well. Mark your calendar to purchase your tickets in November. You won't want to miss this event! Be sure to go to the event dressed in your best pirate clothing, costume or attire. For some of you that may be your daily manner of style, but if not here's some ideas for pirate attire and costumes. Arrr! Get a Degree to Talk Like a Pirate? 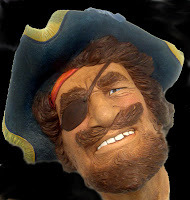 International Talk Like a Pirate Day is September 19th each year. If you don't have the talent to talk like one, maybe you can work on your pirate voice by taking some classes. Say what? Where are you going to take classes to talk like a Pirate? Can you get a degree for that? Of course not, but I just want to see if I can get your attention, and encourage you to practice so you can talk like a pirate.